We Excel in Creating Utopias. Master Plan Your Life: Design energized, nourishing, stress-free living environments. Seamlessly flow between your interior and exterior spaces. Custom -design your property to be timeless and elegant, sustainable and innovative. Craft a spirited PLACE that exudes your essence. Learn from the masters: Dargan Landscape Architects. Licensed, seasoned landscape architects, Hugh and Mary Palmer Dargan, ASLAs, enjoy creating custom master plans for living environments. Their designs for residential properties, museums, churches and campuses have received innumerable awards, print and TV media coverage. Pick up a magazine and their gardens are probably inside…and have been decades. Now almost 40 years into honing their craft, the Dargans travel far and wide to assist in creating transformative environments. They offer one-on-one VIP days and master plan packages. Their story is far from usual. Hugh and Mary Palmer met at a Southern Garden History Society ( SGHS) meeting, fell immediately in love and began a design conversation that has never stopped. Married in Charleston, SC, their wedding trip in 1985 included both a British National Trust course in restoring historic landscapes and work at The Earl of Wemyss’s home, Stanway ,“ The Queen of the Cotswolds”, in Gloucestershire. While there, they were houseguests of the legendary landscape designer, lecturer and author, the late Rosemary Verey. They travel extensively to study gardens to see what makes them tick! Their love of England never faded and they return often, sometimes with adult student in tow. Guiding the restoration of historic houses and Charleston gardens in the eighties and soon gave way to larger canvases. To date they have projects completed in over twenty-two states, plus Central America, Europe, The Virgin Islands and Great Britain. 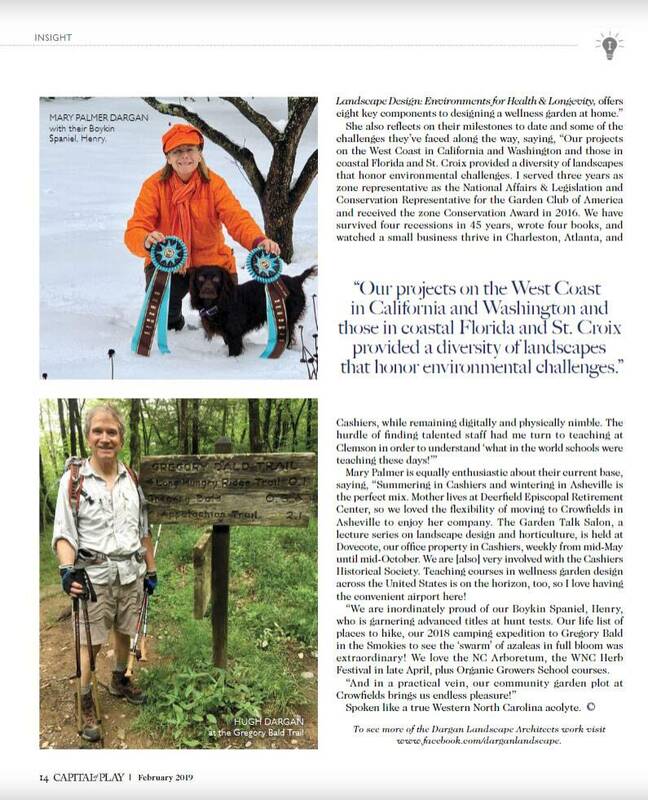 Hugh is a founding Board member of the SGHS and Mary Palmer, a founding member of the advisory committee for The Garden Conservancy . Birthing books as well as landscapes, the Dargans best-selling, texts are the top transformative landscape design books of this era. Timeless Landscape Design: The Four Part Master Plan (Gibbs Smith, 2007), The Early English Kitchen Garden ( LSU, 1982) and Lifelong Landscape Design ( Gibbs Smith, 2012. Teaching is inherent in their lifestyle. 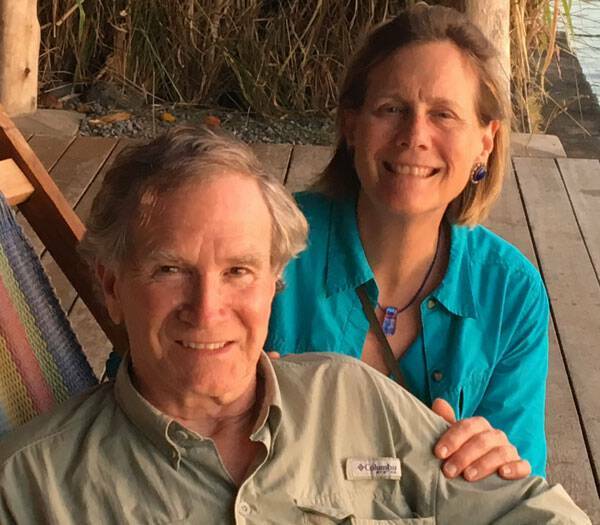 Hugh and Mary Palmer taught adult landscape design courses at The University of South Carolina at the Columbia and Charleston campuses, The Art of Landscape Design Studio in Charleston Charlotte, Virginia Beach, Houston and Tulsa amoung many. Keynote lectures are legion to garden clubs, professional organizations and historic houses. Mary Palmer was a professor of Landscape Architecture and Planning at Clemson University and created The Clemson Certificate of Landscape and Garden Design, as well as teaching a full load of undergraduates. Health care, or therapeutic garden design, is integral to their practice. Mary Palmer and Hugh attended the Chicago Botanic Garden Certificate program, the only one of its kind, for advanced training in this field. Mary Palmer was awarded The 2002 Environmental Award from the American Horticultural Society for A Garden to Heal the 5 Senses exhibited at the Southeaster Flower Show. Educated long ago as a landscape architect, Hugh attended The University of Georgia and graduated in 1973. Mary Palmer, also trained as a landscape architect achieved Masters in the field from Louisiana State University (1981) and enjoyed a degree in Botany from The University of Tennessee (1976). She was Botanist and Education Director at Cheekwood, The Tennessee Fine Arts and Botanical Garden in the late seventies. 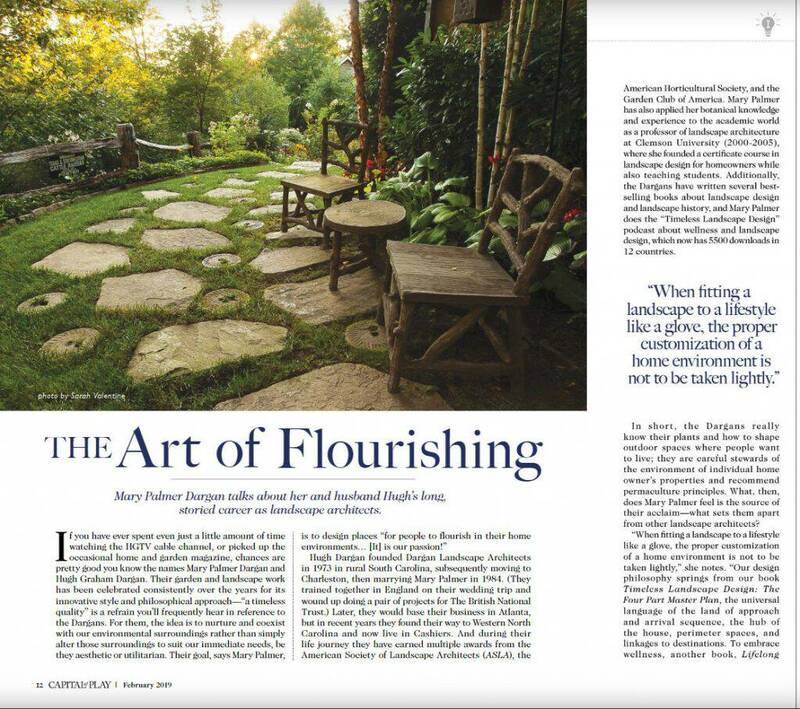 Mary Palmer loves plants and is an accredited Horticultural Judge with the Garden Club of America and judges national shows, including the Philadelphia Flower Show. Business studies at The Harvard School of Design rounded out her education. Read about the Dargans from Capital at Play (February 2019).